Serial Number: 1814142. 33mm case size. 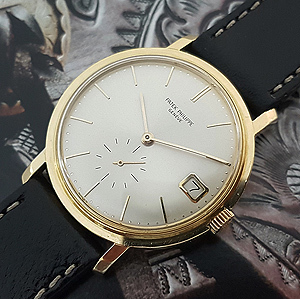 18K yellow gold case on leather strap. Enamel dial. Sapphire crystal glass. Engraved case back. Manual wind calibre 215 movement. Complete set with Patek Philippe box and papers. Acquired from the guardian of the estate of the original owner, this watch has spent a great deal of time safely preserved. 18K yellow gold case, 35mm case size (engraved). 3445 movement calibre 27-460M automatic, date function. 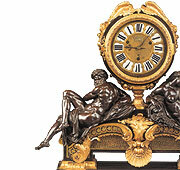 Original and unrestored dial and hands. 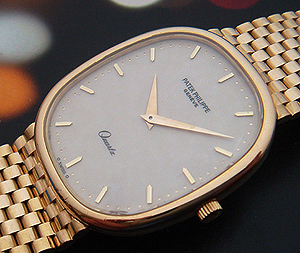 Calibre 27-460 is one of the best auto movements of the golden Swiss era; a true purist’s timepiece. Serial number: 1506127. Case diameter: 32x25mm. Thickness 6mm. Solid 18K yellow gold case on 18K YG bracelet with deployant clasp. 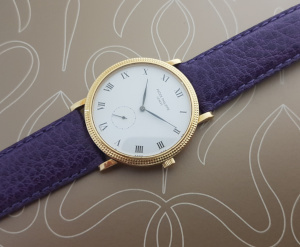 Ivory enamel dial with yellow gold hand and hour markers. Quartz movement. Sold August 1983. Very fine and very rare. Watch comes with original Patek certificate.